This is a curved square Buffalo Brewing Co. porcelain sign. This particular Buffalo Brewing Co. sign is predominantly light blue with dark blue text. 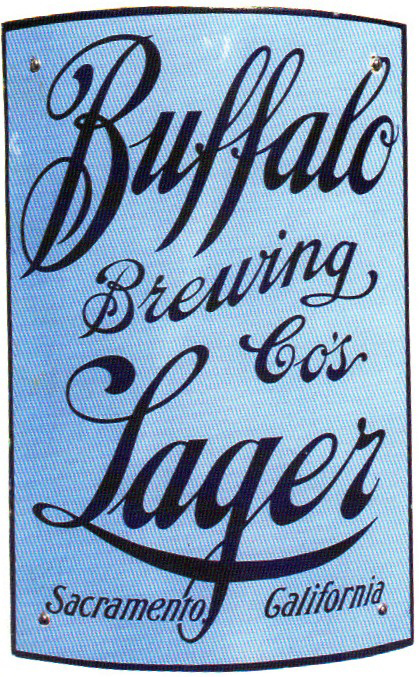 It reads, “Buffalo Brewing Co.’s Lager, Sacramento, California” and features a dark blue border. Buffalo did lots and lots of advertising. It is probably one of the few breweries where you can collect all types of ads from porcelain signs to tin, chargers, and beer trays. This curved sign is extremely rare and highly prized by the serious group of collectors buying Buffalo Brewing memorabilia.